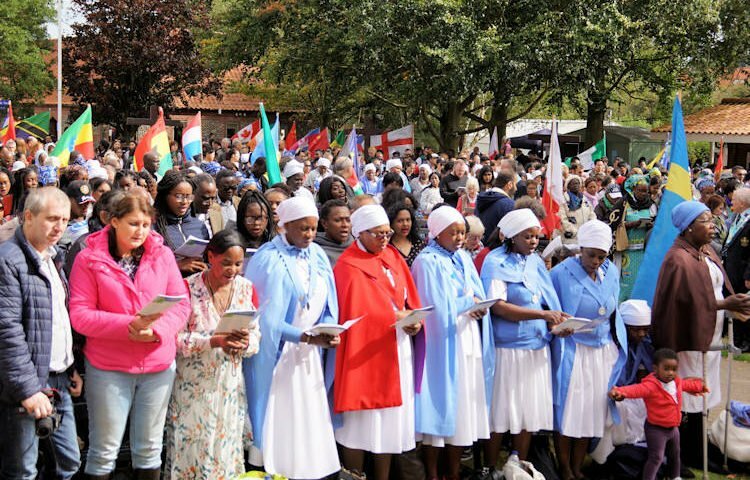 Around 2,500 pilgrims, representing the world-wide Catholic Church, gathered at the National Shrine of Our Lady at Walsingham on Sunday September 16 for the annual Dowry of Mary Pilgrimage. Led by the Rt Rev Alan Hopes, Bishop of East Anglia, the day of pilgrimage began with a colourful parading and reception of national flags and banners including from the Philippines, Vietnam, Benin, Lithuania, England, China, Sri Lanka, India, Trinidad, Ethiopia, Congo, Zambia, Zimbabwe, Eritrea and Ghana. The many national groups said the Hail Mary in their own native languages. The Rector of Walsingham, Mgr John Armitage, gave the homily and spoke about Mary as the picture of humility. “Humility is both the heart and the way of the Christian message. What we have is a gift and the gift is God himself. We are loved regardless and humbled by God’s forgiveness,” said Mgr Armitage. “In the face of a deeply individualistic culture, people of faith offer community. In our communities we value people not for what they earn or what they buy or how they vote but for what they are. Every one of them is a fragment of the divine presence. A solemn Mass of Our Lady was then celebrated by Bishop Alan in the open air Chapel of Reconciliation. After picnic lunches, pilgrims processed, many singing and dancing, along the Holy Mile between the Catholic Shrine and Walsingham Abbey where the bishops conducted a Benediction of the Blessed Sacrament and said prayers at the original shrine site in the Abbey grounds. The pilgrimage is named after the 14th century convention of England being known as the “Dowry of Mary” and is the principal pilgrimage in honour of Mary. Click here to watch a video of the Mass.